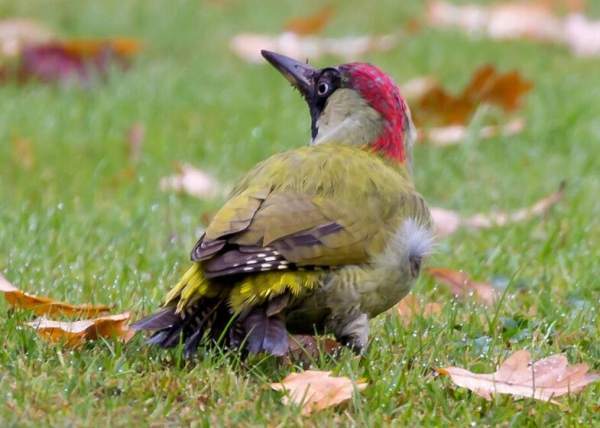 This is the largest of the three woodpecker species that breed in Britain, and it is mainly seen in farmland, parks and occasionally village gardens. 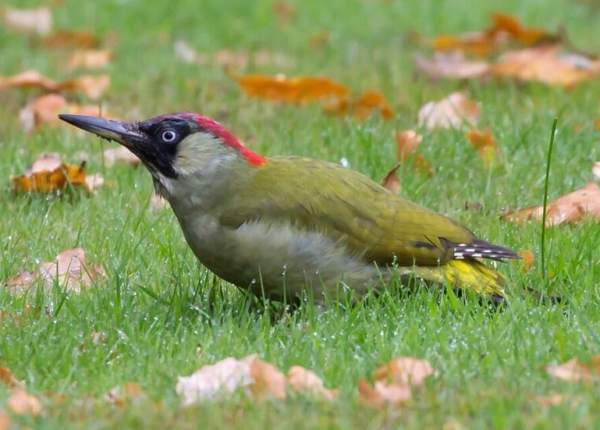 Green Woodpeckers are lowland birds and, despite their largish size - about as big as a pigeon - they feed mainly on insects; they are particularly fond of ants, and they raid ants' nests in the dry sandy soil at lawn edges and beside rural lanes. 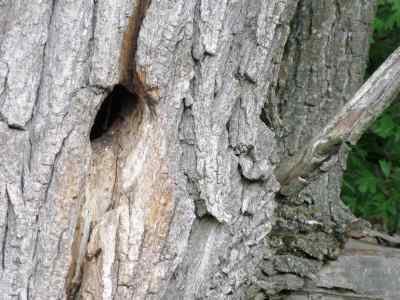 The nest of a Green Woodpecker is nearly always situated high up in a tree, in a hole that can take up to three weeks to excavate. (Occasionally they will use a nest box provided it is mounted high up on the trunk or on a large branch of a tree.) Green Woodpeckers have weaker bills than other members of the woodpecker clan, and they rarely 'drum' on tree bark to evict beetles and other insects; instead they feed much more on the ground. The breeding season runs from April to July, and these birds produce just a single brood of up to seven eggs that take nearly three weeks to hatch. The distinctive call of a Green Woodpecker in flight is sometimes referred to as a 'yaffle'. When you hear it, look out for the birds, which like other woodpeckers fly in an undulating manner.